If you have been to Ireland recently then you have seen the wind turbines. Like daffodils in the spring they seem to be popping up all over. Unlike daffodils, the wind turbines aren't vanishing weeks later. They're much more permanent. I have two problems with wind turbines: they're ugly and they're heavily subsidized. That doesn't mean, however, that I'm entirely opposed to them. Ugly doesn't really matter at all. In fact, I know quite a few people who don't mind the look of them one bit. Some people even seem to like them. I disagree with them. When I'm driving through County Leitrim in Ireland or Livingston County in upstate New York and I see windmills on the distant hills I feel like my view is spoiled. I like the natural look. I know, I know. Scenery - is it really that important? My mother has often said to me, "you can't eat scenery." So if there's money to be made in wind farms then that takes precedence over whether I can enjoy an unspoiled view of the treeless hills of Ireland. Ah, but then again, there are quite a few people in Ireland who are now "eating the scenery." Or at least they're earning enough to put food on their tables and a roof over their heads thanks to the money that tourism provides. Would as many Americans, Germans and others travel to Dingle or Connemara or wherever if the views on offer were predominantly giant white wind turbines? Doubtful. So the financial benefits from wind turbines have to be assessed against possible losses in the tourism trade. All of which brings us to ... money. This is where the subsidies come in. Wind energy cannot compete with its natural gas competition so the Irish government subsidizes wind-generated power. Without the subsidies there would be far fewer (read ZERO) wind turbines on the Irish landscape or offshore. This is the problem with subsidies: the wind turbines we have are not efficient enough to warrant using them. Rather than wait for the day when they will be cost-effective - and that day may be coming soon - the Irish government forces us to pay to have our view spoiled. Yes the government subsidizes other industries, but at least in all those other cases there is an arguable benefit to Ireland. With these turbines the only benefits accrue to a few landowners and subsidy-chasing investors. Oh, and there is the vague possibility that there will be one inch less erosion of the coast in 2163. Recently a new twist has been added to the wind farm mania: Britain. 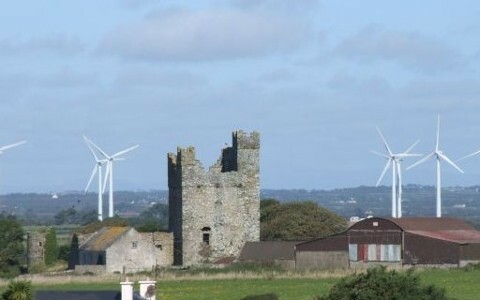 The idea is that the British government will subsidize wind energy companies to turn a chunk of the Irish midlands into a giant British wind farm, with the support and assistance of the Irish government. The obvious question is why: two "why's" really. Why aren't the British companies erecting these wind turbines in Britain and why is the Irish government keen on this idea. The answer to the first "why" is that the people of rural Britain are fed up with wind farms. They don't want any more. They're sick of the sight of them; they're sick of the sound of them. So Britain looked across the sea, saw all those complacent people only barely occupying Ireland's midlands and thought, "let's see if we can put those things up there?" The second why is even easier: money. Again. The Irish government is talking this up as a windfall for the national coffers, which it may or may not be. Even if it nets a gain for the government I still don't like it. Why? Because there will be no benefit to the locals other than those few landowners. Wind farms don't produce jobs, save a maintenance job or two. There will be no wind industry in the area. There isn't even a local tax benefit. Local planning regulations are to be ignored. There will be nothing for the locals other than huge wind turbines dominating the landscape. That is simply wrong. There has to be a general, local benefit to these sorts of projects - especially one like this where the very idea arises out of vehement local objections in Britain. It isn't right for the Irish government to rent a piece of Ireland to Britain to soothe the British government's climate conscience. It isn't right for the government to treat the concerns of those who have to live with these things with disdain.